With a slight dog leg to the right, the 1st hole is relatively easy due to its limited length. However, you must be supremely accurate with your tee shot or you may find yourself in the line of trees down the right side or in the hazards down the left. Protected by a number of bunkers, the green is set on a double ridge which is easy to read. The 2nd hole is the first par 3 going out and is quite short but any balls which find the edge of the green will not stay on its convex shape. You may pay a high price for any risk you take off the tee but any lay-up may will be severely punished. You must be careful with this blind tee shot on this par 4. In fact, if you drive too far down the left, the tree on the fringe of the fairway will block your approach to the green. You can play safe by aiming straight down the middle of the fairway. The second problem comes in the form of the strong incline of the green (one of the hardest on the course) which will feed your ball into a deep bunker located on the right. Caution and application will therefore be the most beneficial approach for you to adopt. As the first genuine challenge on the front 9, the 4th hole provides a view looking down onto the green. The large bunker on the right of the fairway will obviously gobble up any shots in that direction. However, playing down the left can be dangerous as the edge of the wood on the left is out of bounds. The rising green will hold a well-struck ball but you should make sure that you do not come up too short or go too far right as your ball may be swallowed up by the ditch which adjoins the green. The treacherous green will sweep your ball to the right but an excessively cautious shot to the left will leave you a very delicate downhill putt (or a bunker shot). The second par 3 of the course will require great accuracy off the tee as the green does not afford many areas where you can stop your ball. The green is surrounded by bunkers and, to make your task easier, you would be well advised to leave yourself an uphill putt. The first par 5 is pierced by a dog leg to the left which calls for an accurate tee shot so that you have an open second shot. You will be penalised if you go too far left. The longer hitters among you will reach the green in two which will give you the change of a well-earned birdie. The green is set on a double ridge and the problem arises in terms of the length of the approach or the long putt if the flag is on the second ridge. A carefully considered shot on this dog leg to the right will give you a real chance of getting through this hole unscathed. The green is split into two areas and provided that you get the length of your second shot just right, you will be left with a putt that is not too difficult to negotiate. This long dog leg to the right gives you some margin for error provided that your shot is not too long. The longer hitters can try to reach the green in two, at least if there is not a sustained prevailing head-wind. But the area behind and to the left of the green is out of bounds which will make it a rather tricky task. The green is relatively flat but it is well protected by three bunkers which will force the most experienced players to adopt a considered cautious approach. This long par 3 severely tests even the most patient of players. The left-hand side bunker is quite deep and will swallow any balls that roll off and complicate the task of any inaccurate players. The most difficult hole coming in is a par 4 and requires a lengthy tee shot to make sure that you are not left with too long an approach shot to the green. As there is a blind landing area for long hitters, you are better off playing your shot slightly to the left. You must be precise when attacking the green or your ball may find one of the two green-side bunkers. The green pushes balls to the right and its strong incline will lead to a three-putt (or even worse) if you are not fully focused. This 375-metre par 4 will require accurate shot-making to prevent your ball from finding the rough or the trees lining the fairway. To give yourself a good chance of par, you will have to correctly weigh up the depth of the second shot so that you do not leave yourself a downhill putt (too short will always be better than too long on this green). 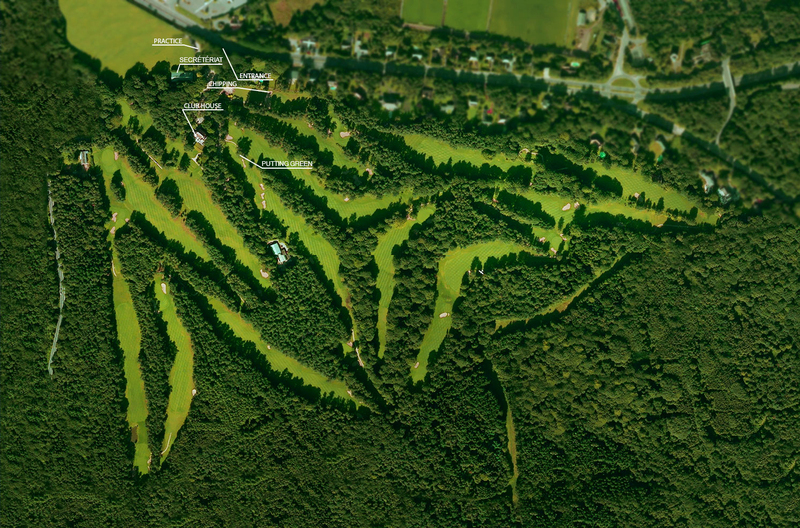 The longest par 5 on the course slopes downwards all the way to the green. The difficulty will be in keeping a check on your enthusiasm and not risking going for the green in 2 unless you have hit the ball long and to the right. For those of a more cautious disposition, the third shot will only present one relative difficulty and the hole will make for good reading on your score card depending on the putt you are left with. You should watch out for the water hazard if you slice your ball. The flat-looking green will come back to haunt you if you are not on your guard. This 350-metre rising dog leg to the left is relatively wide but you will pay dearly for any rashness. You will be required to drive the ball a certain length off the tee if you wish to avoid bringing the hazards into play and/or leaving yourself a blind shot into the green. Bear in mind the ascent and the prevailing head-wind when you take your second shot. The green is relatively flat although slightly sloping on the left and you would be well advised to aim for the centre of the green. Second par 5 of the back nine, unlike the 14th, this hole climbs from tee to green. You will have to weigh up the depth of your stroke into the green as it will be a blind shot. Be careful not to lay up too close to the green as you may find your ball in one of the bunkers or, worse still, buried deep in the wood. The green is quite long and your balls will tend to drift towards the right-hand side bunker. The most accessible hole on the course (phew!) as this rather short par 3 will not penalise small mistakes in view of the fact that the bunkers do not really come into play. Having said that, be careful of the slope as it will release balls to the front edge of the green or will leave you with a relatively delicate downhill putt. A par 5 to finish on a good note…Admittedly, this 436-metre hole will not intimidate the longest hitters out there, but the bunkers might just do so. A good draw shot will open up the second shot and, provided that you carefully position your second shot, you will have a reasonably easy shot into the green. Furthermore, the green is generally flat. But don’t forget that down the left is out of bounds.